The French are bigger than we are. So are the Americans. But does size matter? And to be specific, how big is ours? We speak, of course, of the size of the UK snowsports market. 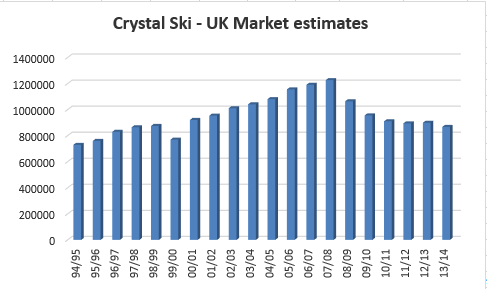 In recent years the Crystal Ski Industry Report has always been the starting point for scaling the UK market. Up until this year, the company has endeavoured to estimate the market size in its annual report. This has suggested a market size that peaked at 1.2 million in 2008 and which has declined until last year. However, this year, for the first time in 20 years, the company did not attempt to size the market. This was a shame as while there were limitations in their methodology, there was at least a headline figure for the industry to work with. 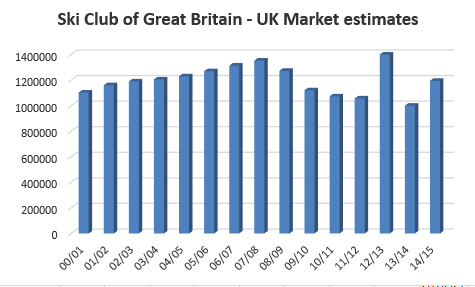 The second source of industry size has been from the Ski Club of Great Britain. Their annual industry report has typically been published three to four months after the Crystal report and has leaned on the initial report as a source for its own findings. By recognising the greater influence of the independent market than the report by Crystal, the Ski Club report has typically sized the industry slightly higher. Their figures from the previous 15 years are shown below. Note that in the last three years, their report has had a different format with a focus on Net Promoter Score and not been on the headline figure. The 12/13 figure also looks anomalous. Is the market significantly larger than thought? In the last week, we’ve seen two larger estimates of the size of the market. The first was from Laurent Vanat, author of the highly regarded International Report on Snow & Mountain Tourism. Vanat was presenting some of the data from his report at the LISTEX this week. His figures suggest the UK has a total market 6.3 million, of which around 2 million are currently active (i.e. they have skied or snowboarded in the last 12 months). This figure is much higher than any other reported to date because Vanat believes the independent sector has been under-reported. His workings are based on a 10% overall participation rate, benchmarked against other countries. These numbers are backed up by research from the Sports Marketing Survey conducted in 2014, which suggest around 2.2 million people from the UK participated in skiing or snowboarding in the previous 12 months. Of interest, this same survey put the active golf market at 3.5m and cyclists at just over 7m. A bigger market is self-evidently more appealing. It’s easier for start-ups to get funding and means existing players can be more bullish about potential growth. On the other hand it means that all tour operators suddenly have a much smaller market share than previously though – but they shouldn’t worry – after all, size isn’t everything!